Aprovecho scientists Nordica MacCarty, Damon Ogle, and Karl Walter developed the Portable Emission Monitoring System (PEMS) to provide stove projects with a simple, effective, and less expensive emissions hood for in-field emissions collection and measurement. It is a stove laboratory that can be carried as airplane luggage. The PEMS displays emission levels in real time. It also calculates total emissions of carbon monoxide, carbon dioxide, and particulate matter released during a cooking task. Analysis provides total emissions, specific emissions, emission factors, and pollutant/CO2ratios that highlight the various factors of combustion efficiency. It uses the same set of sensors as does the LEMS (when the optional gravimetric PM2.5 sensor is included), but its blower is upstream of the sample point and it has a shorter mixing duct. For these reasons it does not meet the ISO methods currently being developed. Contact Sam Bentson for more information. 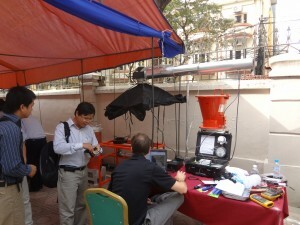 The PEMS set up for a training at a field lab in Vietnam.